Dilami Androm is a Dunmer caravaner whose silt strider is available for hire in Molag Mar. 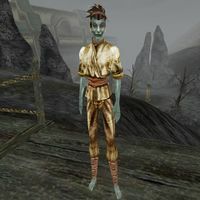 From there, she can take you to Suran or Vivec for a price. She wears a common shirt with matching pants. Aside from her natural resistance to fire and the sanctuary provided by her ancestors, she knows no spells.